This entry was posted in Museum and tagged Museum on October 9, 2012 by Wire Eagle. AUBURN UNIVERSITY – Two area high school students will perform their nationally recognized performance piece, “A Tragedy of Errors: America’s Hypocritical Reaction to Artistic Diplomacy,” Oct. 13 at 10:30 a.m. at the Jule Collins Smith Museum of Fine Art. They will bring to life works from “Advancing American Art,” one of the museum’s permanent collections. 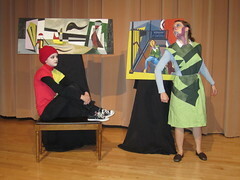 The performance coincides with the museum’s ninth Birthday Party and Family Day from 10 a.m. to 1 p.m.
Heather Connelly and Katie Kirk developed the piece for National History Day, a competition that has qualifying rounds at the state level and culminates in the Kenneth E. Behring National Contest at the University of Maryland, College Park. Connelly is a junior in the International Baccalaureate Diploma Program at Auburn High School. Katie Kirk is a homeschooled junior who is also in the International Baccalaureate Diploma Program. The pair won bronze for the Senior Group Performance at the national level this year. In the piece, Connelly and Kirk take on the persona of two pieces of artwork in the “Advancing American Art” collection. A post-World War II touring exhibition, “Advancing American Art,” was commissioned by the U.S. government in 1946 but later disavowed by U.S. politicians who decried the collection based on immigrant artists’ names and the leftist views of some, hinting at the red scare in years to come. Stepping out of the picture frame in costume, each student tells the story of this historical collection, from the initial warm response from viewers in New York, Paris and Prague, to the backlash at home and the project’s demise. Kirk created her character based on Werner Drewes’ “A Dark Thought (Was Visiting My Peaceful Backyard).” She said the study of the works and historical context went beyond the museum walls. “The most valuable part of our research involved poring over the bibliographies of books written on the art and then exploring the Auburn University library to find original copies of 1940s news articles about the exhibit,” Kirk said. Connelly described the National History Day competition atmosphere as unforgettable. While both Connelly and Kirk have extensive backgrounds in performance in the classroom and in their extracurricular activities, they said a little bit of nerves comes with the territory, especially in the final stages of competition. Kirk encouraged other students to enter their research projects and believes more entries at the state level would strengthen scholarship. To Andrew Henley, curator of education for K-12 at the museum, a dramatic interpretation makes history lessons accessible. Connelly said she recognizes that while 21st century artistic tastes are more accustomed to the modern styles presented now as “Art Interrupted,” the story of “Advancing American Art” should continue to be told despite the passage of time. Kirk agreed that a collection like “Advancing American Art” would be received differently today, but there are relevant themes. She said the debate about what is “American” still rages on. To watch a preview of the performance, visit the museum’s YouTube channel: http://youtu.be/LuYny8w4qjo. For more on the current exhibition on display at Auburn through Jan. 5, visit www.artinterrupted.org. “Art Interrupted: Advancing American Art and the Politics of Cultural Diplomacy” is organized by the Jule Collins Smith Museum, the Georgia Museum of Art at the University of Georgia and the Fred Jones Jr. Museum of Art at the University of Oklahoma and was made possible by grants from the Henry Luce Foundation and the National Endowment for the Arts as part of American Masterpieces: Three Centuries of Artistic Genius. For more on National History Day, visit http://www.nhd.org/.